I'm keen to share things that I've done with others - I love learning about culture and history, I know the importance of great service, good quality products and positive experiences. I love to experience life's opportunities. I live in Melbourne. In the 1870's, Herberton near Cairns in Far North Queensland supported the richest tin mining field in Australia. After flooding in 1882, the town was virtually cut off and miners faced total starvation as they couldn't get supplies. 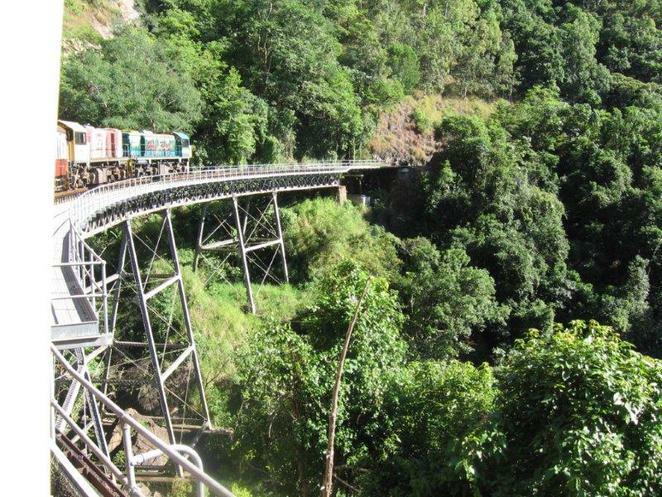 A new weather-proof transport route was desperately needed so construction of this railway was started through the rugged dense rainforest, sheer cliffs and steep slopes. Using their own picks, shovels, dynamite and bare hands, teams of men created these 15 tunnels, 93 curves, dozens of bridges and 75 kilometres of track. 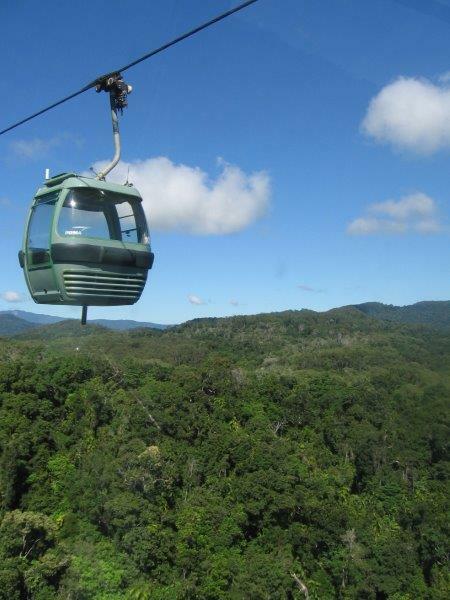 This - the Kuranda Scenic Railway - has operated from 1891 until this day. You can catch the KSR at Central Cairns Railway Station or at Freshwater Station, just out of Cairns. As we journey out of Cairns and meander up to Kuranda, the changing landscape glides past – first urban, then commercial, industrial, residential and then rural. After around 20 minutes we arrive at picturesque Freshwater Station, built in the style of the historic railway. Once past here, the track climbs into rainforest and the scenery and views really begin. All along the journey, an informative commentary provides the track's history to accompany the stunning, beautiful and sometimes breathtaking views. Friendly train staff come through the carriages and offer to take photos of passengers, so we each have a memento of the journey. The commentary is timed well and I get good advanced notice of interest points or places where the best photos can be taken. The train doesn't stop for most photographs, but winds its way at a steady pace so when a view of the Cairns hinterland, coastline, approaching Horseshoe Bend or fantastic Stoney Creek Falls comes, I have a chance to get in position to photograph them. The train makes one stop for photographs – at Barron Falls. This is a marvellous cascade – particularly if there's been a lot of rain recently. Around 15 minutes is spent here, so I can stretch my legs in a short stroll too. 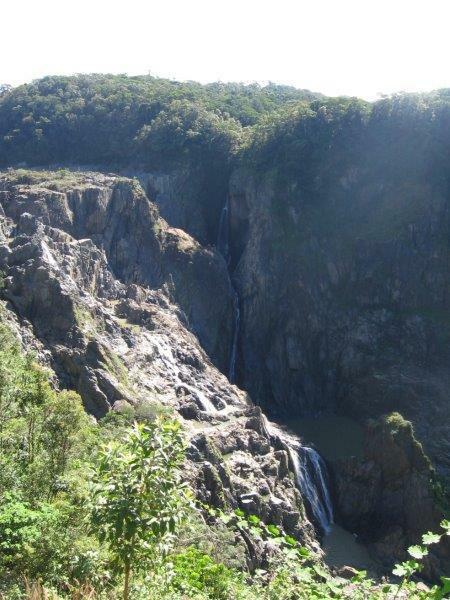 After Barron Falls, the next stop is the end point at Kuranda. 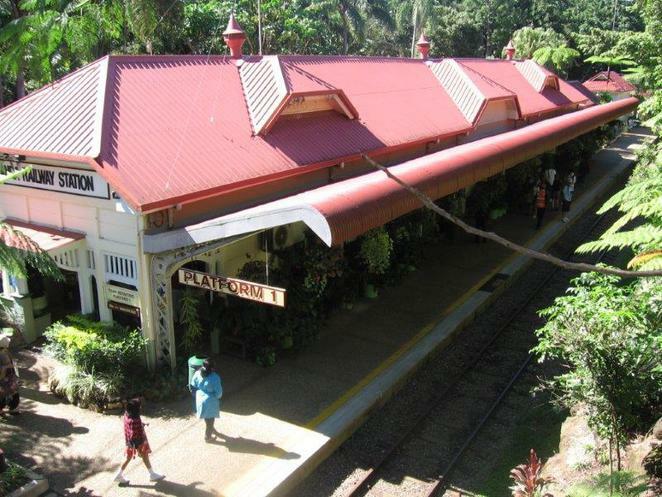 Kuranda Station is a pretty and historic building. Refreshments and merchandise are available here and the path into the town is clearly marked. Note though, this is up a bit of a hill, so you may need to allow some time to walk the 500metres or so to the town itself. There's plenty of time to explore the town. Two trains go up to Kuranda each morning (departing Cairns at 8.30am and 9.30am) and two trains travel back to Cairns each afternoon (departing Kuranda at 2.00pm and 3.30pm). There's wildlife (including the Kuranda Butterfly Sanctuary), demonstrations of indigenous culture (with traditional dance, didgeridoo, boomerang and spear throwing), World Heritage Rainforest, art galleries, markets and shops. For the peckish, there are restaurants, cafes, bakeries and hotels. The railway station and the Skyrail station have refreshments too. The popular Kuranda Market has locally made arts and crafts. For an alternative, I take the Skyrail back down to sea level, so I must find a different station to catch this and it is clearly marked, right next door to Railway Station. I allow good time to walk back down the hill from the town. The Skyrail is a continuously running cableway of passenger cars. These move along all the time, so when I climb aboard you must step into the car while it momentarily pauses at the station. A very helpful staff member is here to assist me. Each car fits up to 6 adults and as it runs continuously, there's not really a timetable. There's probably only a minute or two to wait at each station for the next empty car to arrive. The Skyrail is a lovely ride - I glide along above the rainforest treetops - it's peaceful and enjoyable. The first stop (after 10 minutes) is Barron Falls. This time, the Falls are on the other side of the valley and I can see the railway station I stopped at on the KSR on the way up. From here, the aspect of the falls is far more impressive. It is an awesome waterfall and I do recommend taking the short walk to each of the three lookouts for photographs. There's an good information centre at this station and at several other stops where I learn more about the area's culture, history and wildlife. The next stop is Red Peak, where I must vacate my passenger car and change Skyrail tracks to head further down the valley. It's easy though, I just follow the boardwalk that encircles the station and there's a very helpful Skyrail staff member to make sure I go in the right direction. In fact, at all times the Skyrail staff make sure I know what's happening and what's coming next.